Last night my dear friend Hannah Skvarla invited me to the launch party of her newest endeavor with her bff Lauren Conrad – the little market. Hannah volunteers for Human Rights Watch and has travelled the world seeking creating opportunities for communities struggling with poverty in developing countries. Lauren Conrad was a former television reality star and now a best selling author and fashion maven for Paper Crown and LC Lauren Conrad lines. 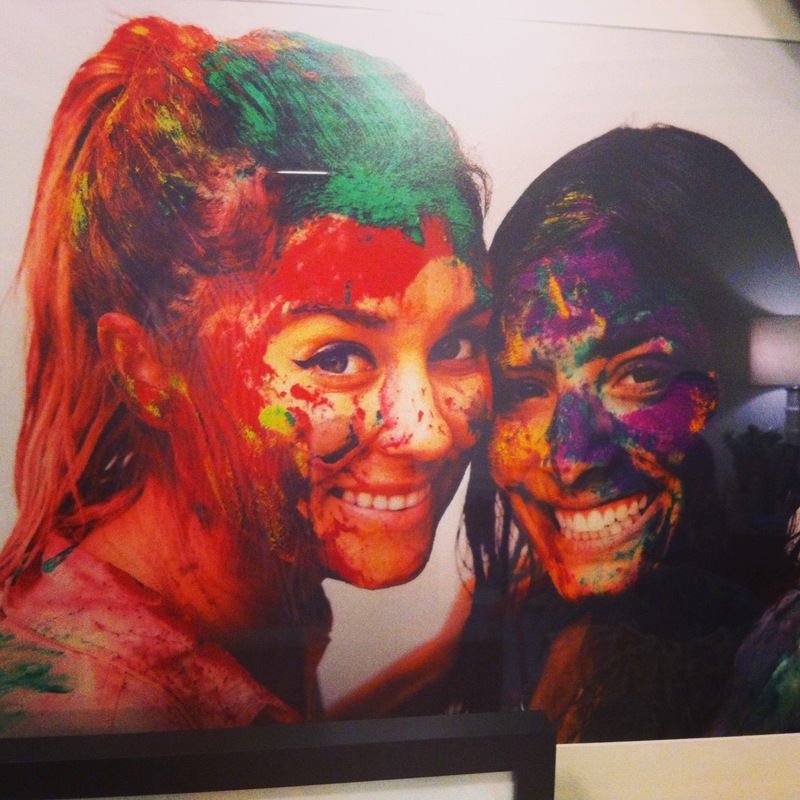 Hannah and Conrad met years ago at FIDM in Los Angeles. Lauren was one of Hannah’s bridesmaids at her wedding and is now helping Lauren with her upcoming wedding. Throughout the years, their friendship blossomed into a vision of sustainable support for women and their families. This dynamic duo created the little market to help artisan groups in developing countries around the world. Hannah and Lauren help these talented artisan partners showcase their skills to a broader audience. The work from these groups is funded through earnings from the sales of their fair trade and locally made products. On the little market website you will find artisan aprons and scarfs with matching beanies made from Alpaca wool. For babies, they sell adorable knit bears and knit cardigans with matching caps. There is also a home decor section and must-have holiday gifts. Many are perfect as a hostess gift for a holiday party. They sell a felt elephant that would make a beautiful ornament for a Christmas tree. The little market is a place where a global community can come together to combat poverty, empower communities, and create social justice. This dove is handmade by Nepalese artisan women. These two entrepreneurs were on the Katie Couric show Oct. 15 showing Ms. Couric some of their products from around the world. 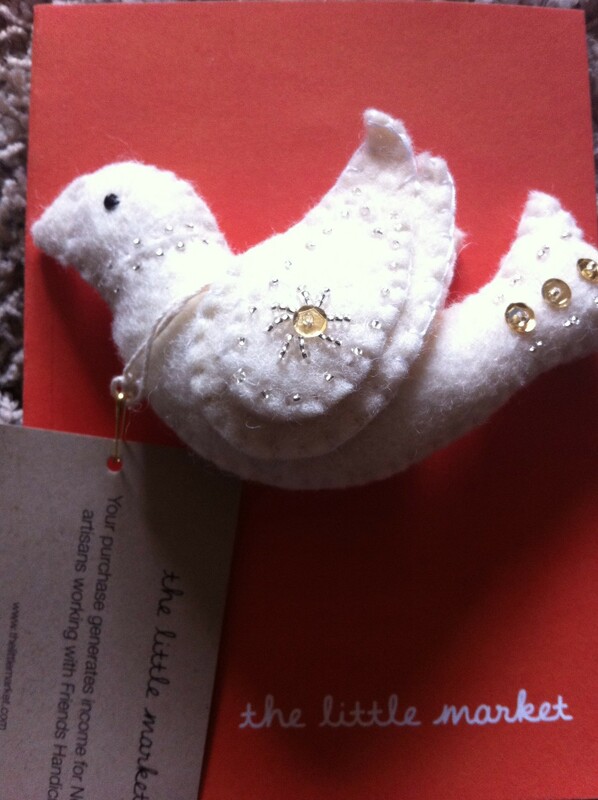 One that caught my eye was a beautiful little felt dove adorned with beads and sparking sequences. Hannah and Lauren found these doves while visiting a group of ladies in Nepal. They sell them for $12. As soon as the show ended, these peaceful doves SOLD OUT. The artisans are crafting and shipping a new batch just as quickly as they can. I received a felt dove upon leaving the event. On the tag, it said “Your purchase generates income for Nepalese artisans working with Friends Handicrafts. This organization fights urban poverty in Nepal by training and employing women in the art of felting. The income these women earn helps them provide the essentials for their families – food on the table and education for their children. Do you holiday shopping and feel good about the gift that gives twice: providing work to women artisans and a beautiful handmade treasure to your loved ones.